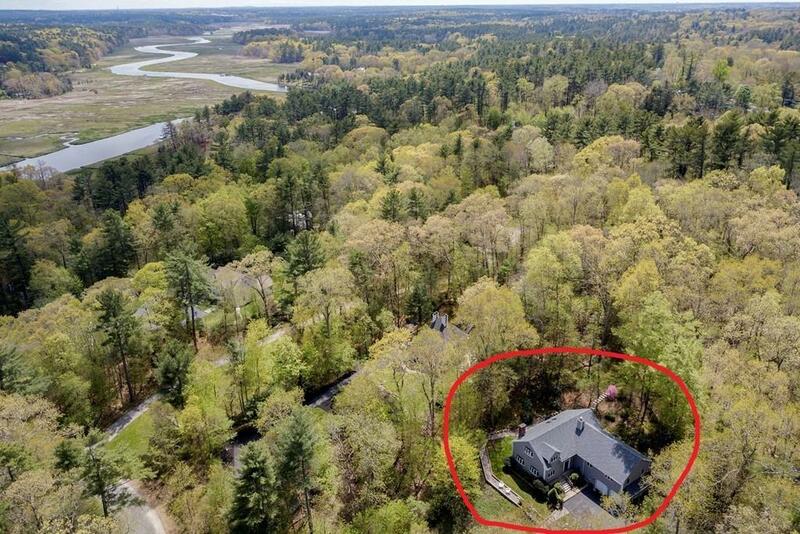 This pristine contemporary home enjoys a unique private setting in a very desirable intown Norwell neighborhood. The open floor plan offers airy high ceilings; a step down living room with large picture windows & gas fireplace opens to the dining room and recently updated kitchen with dramatic vaulted ceiling, skylights, 5 burner range plate, built in refrigerator and breakfast bar. The adjacent 4 season sunroom is perfect for casual meals & entertaining, with glass doors to a mahogany deck. The master bedroom suite has an updated bath with soaking tub & shower. There are 2 oversized bedrooms with great storage & a full bath. Step up to a spacious loft which is perfect for a home office, media room or 4th bedroom; plus there is a lower level family room, terrific laundry room and attached 2 car garage. This is a hidden gem, a nature lovers paradise. Step across the street to the Norris Reservation walking trails or launch your canoe at the easy, direct access to the North River.